London Olympics On 27 July, London will be transformed as the biggest celebration of sports in the world kicks off in the newly built Olympic Stadium in Stratford. The stadium has been designed to hold 80,000 people, and the Olympic Village will certainly hold many more. On a normal day, Stratford tube station handles somewhere between 220,000 and 225,000 people. During the Olympic games, Transport for London (TfL) is expecting an additional 310,000 people through the turnstiles, bringing the total to well over half a million. Obviously, if you are one of the regular 225,000, you might save yourself a bit of a headache by going another way – any other way – for the duration of the games. “Stations will have contingency plans in place to deal with crowds, but it will be busy and there will be bottlenecks,” a TfL spokeswoman said. TfL is loading London’s transport infrastructure with as many trains, buses and river buses as it can lay its hand on. During the games the tube will run for an hour later than usual, with the last train departing at around 1.30am. There will be more frequent services on key lines, with up to 30 tubes an hour running on the Jubilee line, for example. The number of buses has been increased on 37 key routes by a booster fleet of 200 single-decker buses. Even the cycling option has been improved: TfL says that an additional 4,000 rental cycles will be available in Stratford. London knows how to do big events: it stages plenty of football matches, rock concerts and so on. But the Olympics are a bigger task than all of those. So how will such huge numbers of people be managed? Or has a lot of the groundwork already been done? Can you build crowd safety into the very fabric of a building? 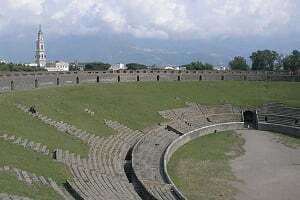 If you had to design the perfect stadium, it would look something like the stadium in the ancient city of Pompeii. According to Professor Keith Still, G4S professor of crowd sciences at Bucks New University, this was as close to perfect as you can get. “The design of the stadium was integral to the city, and the streets were integral to the movement of the people. The Romans really understood the geometric nature of crowd movement,” he says. Still notes that many of the design features of Pompeii would not translate across the millennia. “They had no internal toilets, so the concourses were set up to fill and empty as quickly as possible to get people to and from the building next door, which was all toilet,” he says. 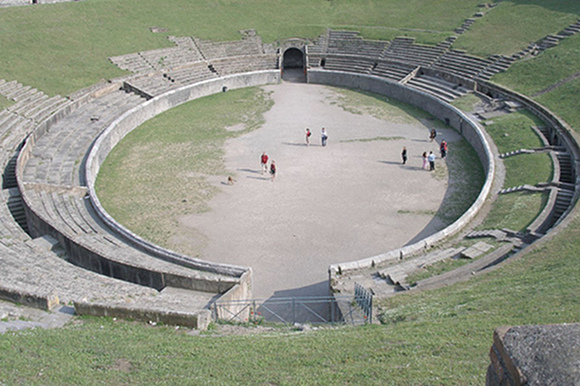 Things have also changed somewhat since the designers of Pompeii were wondering how to get 30,000 bladders safely emptied during an interval. One is that the ancient stadia were designed for pedestrian access only. “You came to see a chariot race; you didn’t bring your own chariot,” says Still. Nor were there any plans to accommodate disabled people, any merchandising to sell or any lifts. Modern architects borrow from the design of these classical wonders, but perhaps without understanding all of the underlying principles, Still observes. “Look at the Millennium Stadium in Cardiff. Would I have designed that to be so close to public transport links? Probably not, in an ideal world,” he says. The reason is that crowds have not had time to thin out before lining up at the venue. “It is not just the building you have to consider, it is the location, the local streets, the transport links. It has to fit within the environment,” says Still. For Tom Jones, principal architect at Populous, the firm behind the Stratford stadium, fitting into the environment was right at the heart of the project. “The master plan placed the stadium on an island site in the southern part of the Olympic Park, to enable it to act as a focal point within the park,” he says. It starts with something as basic as ticketing. Your ticket should tell you not just your seat number but how to get to the venue, so that people with tickets for the North end arrive at the North end rather than the South end, for example. Clear signage is also critical in bringing the crowd from stations and car parks. “The final element is to ensure that there are sufficient stairs and entrance points to the seating bowl and that each of these are appropriately sized for the flow of spectators. Before a stadium can be licensed, it needs to demonstrate to the licensing authorities that people can get in and out safely and that there is enough space in and around the stadium. There are requirements for space per spectator on concourses, flow rate through turnstiles and “vertical circulation” within the stadium and seating bowl. Populous employed specialist consultants to provide a detailed analysis – static and dynamic – of crowd flow. The static modelling is based on flow rates generated by the width of bridges, concourses and staircases, while dynamic modelling uses pixels to represent anticipated movement of spectators entering and leaving the stadium. 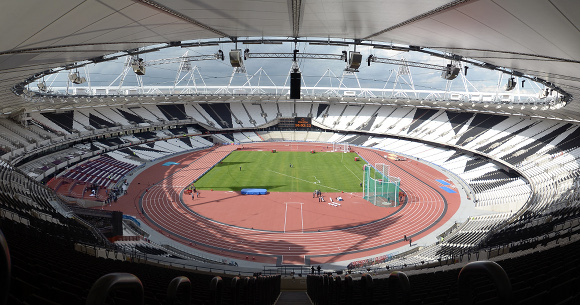 “In the case of the Olympic Stadium, this has involved detailed analysis of spectator movements over the five bridges that link the stadium island site with the rest of the park and then around the stadium,” Jones told us. The work allowed the architects to identify any bottlenecks in the design before a shovel even entered the ground, and to make adjustments as needed. “In exceptional circumstances, we can develop a plan for staged movement which requires the use of holding areas to moderate the flow of spectators,” Jones adds. All this preparation – including communication systems for getting messages to the audience – has impressed Professor Chris Kemp, pro vice chancellor of Bucks New University, which specialises in the study of crowds and crowd management. “Safety costs money. And they have built all the security infrastructure in to the Olympic Stadium and village right from the start. If they had to retrofit it, it would have cost hundreds of millions,” Kemp says. 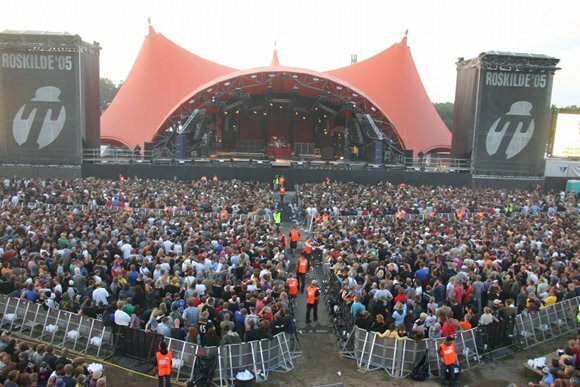 A decade ago, there was a tragic accident at the Roskilde music festival in Denmark. Something went wrong in the crowd and nine people were crushed to death. Professor Kemp began his research after this disaster and says that crowd safety is all about management. Thanks to his and Still’s research, the organisers at Roskilde now separate the crowd into three sections: a front pen with 500 to 600 people; a second pen with between 800 and 900 people; and the rest of the 75,000 festival-goers behind a final barrier. “We’ve been using special barriers with pressure sensors in them to measure the pressure on the barrier at events for many years,” says Kemp. “The pressure at the front of a festival crowd can reach 6.4kN/s – the equivalent of eight people sitting on your chest for a second. But with a three-barrier system, the front pen still has quite high pressure – 4.6kN/s – the second pen registers barely anything – 0.5kN/s – and behind the third barrier, there is none at all. The density of the crowd is particularly important because beyond a critical point – between five and seven people per square metre – people stop behaving like people and start behaving like molecules in a fluid. “At events like the Hajj pilgrimage, crowd density can reach eight to 15 people per square metre,” Kemp says. “When a crowd gets this dense, there is no room for people to do anything but move when the person next to them moves. Still has a simple way of demonstrating how density affects crowd movement. “You can get quite a graphic image of this with a simple loop of string that encircles an area of one square metre,” he says. Once you have more than three people in the loop, each individual is restricted. Marching in step relieves some of this difficulty, but as soon as one person in the crowd marches out of step, he or she becomes an obstacle. Click here for two people per square metre, here for three, four and six. The key is to stop this from happening, and that is where crowd management comes in. “We do quite a lot of research into the psychology of crowds,” says Kemp. “We did a study on policing and stewarding of crowds, for instance, and found that over half the people we asked found police and stewards threatening, mentioning their dark, intimidating uniforms. Once they were dressed in day-glo brights, almost everyone questioned said that they saw the stewards as facilitating their fun day out. This also suggests an easy way of managing the crowd. Stewards can wear colour-coded uniforms according to their role, which makes it easy to see what is going on. “We use a four-tier-plus-one structure. So we have volunteers in the crowd who if they spot something raise one hand and point with the other to the possible trouble spot. Then the second tier – the steward – comes to check it out. He or she reports to a supervisor who will make a decision about what to do, and all this is reported back to the crowd manager,” says Kemp. “If you know who you are going to be dealing with, you know what you need to have to make them safe and secure,” he says. The more information you have about a crowd, from its likely mood through to how it will move at particular densities, the better you can manage it – which is not the same as controlling it. 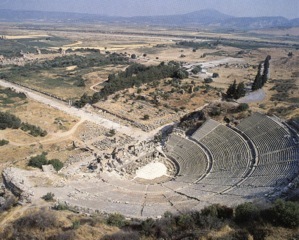 Still is clear that no modern stadium, particularly one in the confines of a city, will ever meet the people-moving ideals of the ancient world. But the planners behind London 2012 have done all they can to give the ancient world a run for its money.